Earth is changing. 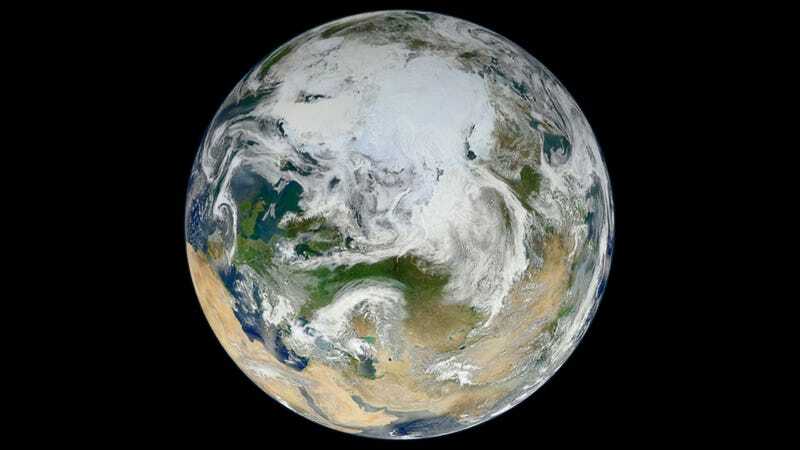 It's changing so fast that images like this one, which show our planet's Arctic polar ice cap in unprecedented detail, could be impossible to capture, as soon as twenty years from now. If you're going to use a picture of the Earth to talk about climate change, it might as well be one of the highest resolution photos of the planet ever taken. This composite image, stitched together from fifteen photographs captured by NASA's recently launched Suomi NPP satellite, is exactly that. Released yesterday on the NASA Goddard Photo Stream, the image is the latest in a series of incredibly detailed views of our planet's surface. This particular vantage point captures the planet's northernmost latitudes in greater detail than any image in history. The most intriguing aspect of the new Arctic image, though, is that this could be one of the last times we'll be able to get a picture like this. Sea ice in the Arctic is disappearing blazingly fast, and by June the summer melt season is usually well underway. 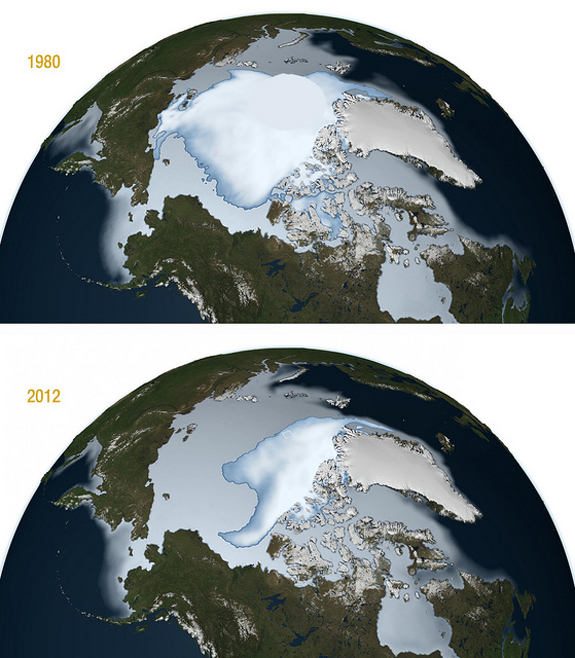 Schultz includes the two images shown here to illustrate how perennial sea ice (that portion of the Arctic ice cap which survives through summer) has declined from 1980 to 2012. It's a dramatic picture, but it does little to portray the cap's steady deterioration over the last several decades. The trend for summer sea-ice extent since 1970 has been downwards, with the past five years (2007–2011) being the lowest of the bunch. The Northwest Passage that links the Pacific Ocean to the Atlantic Ocean through the islands of northern Canada is now clear of ice and open to ships for weeks to months, as is the Northeast Passage that links northern Russia to the eastern side of Greenland. The rate of ice disappearance is faster than models predicted: the last round of models from the Intergovernmental Panel on Climate Change predicted that the Arctic Ocean would be free of floating summer ice by 2070–2100, but in reality it looks likely to happen between 2030 and 2050. "2030 may be more realistic," says Walter Meier of the National Snow and Ice Data Center (NSIDC) in Boulder, Colorado. More info, photographs and video at Goddard, Smithsonian Magazine, NASA and Nature Climate Science.